"We could be the big surprise of the year." "We are a good three tenths behind the BMW Sauber team, but that does not mean that we are the fourth power." Maybe he meant that the big surprise would be that the team would slip even further down the grid! In contrast, Timo Glock's comments have been uniformly low key and it is clear that he does not expect the car to be competitive with the group chasing Ferrari and McLaren. Looking at the testing times, it is fairly obvious where this pessimism originates - apart from one day in Barcelona when the Toyota topped the testing times, it has been a long way off the pace. Which leaves us guessing when it comes to slotting Toyota into our pre-season predictions. It would be easy to assume that the team's results will be roughly equivalent to last year's tale of inconsistency and under-performance, were it not for that final day in Barcelona. Was that evidence of sand-bagging? Or yet another example of Toyota getting it right sometimes by sheer chance? My inability to believe that such a well-funded outfit could get everything so hopelessly wrong two years in a row leads me to suspect that the first option may be correct. And then I remember how Honda seem to be achieving exactly that feat and I am left in confusion again. It's back to guessing and my bet has to be that Jarno and Glock will be fighting with Renault for the last point or two in each race (which says something about where I think Renault will be). The drivers are quite difficult to predict too. We all know Jarno and his impossibly quick qualifying times followed by uninspired race performances. Timo Glock is said to be the exact opposite - not a great qualifier but a demon in the race. That does not augur well for Timo, unless the loss of traction control makes passing a bit easier. Just ask Wurz and Coulthard how hard it is to score after qualifying poorly. It seems likely that Jarno will finish higher up the order on most occasions and we will be left wondering how well Timo might have done if only he had managed to get a bit higher on the grid. There remains a frustrating sense of mystery over the team's prospects, however. I cannot shake the feeling that Jarno's most accurate statement was his suggestion that Toyota could be the surprise of the season. It would not be the first time that a team suddenly came good once the season commenced and our expectations of Toyota are now so low that any improvement will seem almost magical. If you're looking for a dark horse amongst the teams, Toyota is probably the one. I truly agree with Trulli that Toyota may be the Surprise-team of the season. But i don't think it will be a pleasant surprise. Since they began their quest in F1, the only thing they have given are a constant stream of surprises. The first thing they sad was that they was going to build the best car on the grid, but they ended up with one of the worst concoctions of aluminum and fiberglass ever seen. Since then, every year have been yet another dissapointment. I don't see why this year should be any different. At least not as long as they keep Trulli on the team, that man really don't deserve any more chanses. One more depressing driver have i never ever seen before. Have you ever seen that man give a smile? Or even make a joke? Or maybe even just tried to look happy. Well, that may not be the easies feat, considering who is his employer, but he could at least try it sometimes. Well, as you can see, Toyota is not amongst my favorite teams, but i think thats a position they have deserved. How a team can do such a bad job, under such a long time, and not once get thing right is to me one of the really big mysteries. I think the real interest is how Toyota are going to react when Williams blow them into the weeds. It is ridiculous that the biggest car company in the world which boasted of having enough cas in the bank to buy FIAT when it arrived in F1 is going to be blown away by a customer which only has a few hundred employees. Autosport's analysis of winter testing makes interesting reading. The standout comment is they think that this year's Hoda is further off the pace than last year's. How is that remotely possible? Several surveys have shown that Toyota is the least popular team on the grid, Björn, so you are in good company. 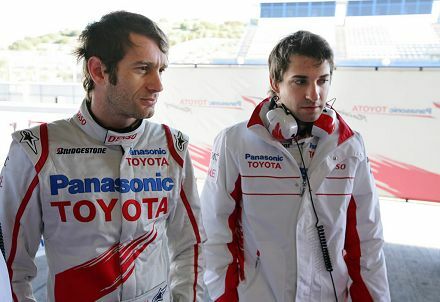 As for Trulli, I have to respect the way he has made the best of a bad situation at Toyota year after year. He may not be the happiest of drivers but he keeps plugging away, doing his best ad sometimes getting results that the car probably doesn't deserve. Testing indicates that Williams should have an even bigger margin over Toyota than they did last year, so we should find out how Toyota react pretty soon. It's been apparent for quite some time that the company's best option would be to buy Williams and rename it Toyota-Williams while closing down their own team. That, I'm told, would be too much loss of face for a Japanese company but how much face are they losing while they continue to be beaten by less well-funded outfits? Well, Clive, there is that simpler option of just NOT providing Williams with engines, period. Although I think you mentioned that in a previous post. The most dissapointing aspect of Toyota is the fact that they are the largest Car company in the world. Being the biggest does not make you the best. But I have owned one or two and they are very dependable. That being said I can not imagine any reason why they can not just buy good engineers and develop the best car in F1. For a company of this size not competing as a top team in F1 is in itself a failure. Living in Japan, I can not imagine Toyota's managment being satisfied with not being the best. Last year was a disaster for them overall. To me the race managment should have been replace or at the least gutted. This years car is not a "built from scratch" chassis. So I do not see great improvement in the team. Trulli may not show much emotion but he is a very capable driver. Glock is his student and is a very capable driver on his own. Personally I like Timo. I hope for his success this year. So if Toyota is the dark horse (which I doubt) it will be the one driven by Timo not Jarno. About being shown up by Williams--this is entirely possible and I anticipate it. Frank Williams is the kind of man that would never "throw his success in the face" of Toyota. He will only complement the Toyota powerhouse that he has. This year, I feel, is the as they say "it" for Toyota. It is put up or shut up time. Their success or failure this year will detemine the fate of Toyota in F1. This is why it is curios to me why an overhaul of the team and the car was not done during the offseason. One explanation is that Clive is correct and everything that I think is entirely offbase. This is the reason why I can not wait for it to start. All of our questions-theories will be given new light after the first couple of races. My only fear about what is going on in cyberspace is the fact that this offseason I have read so many ideas and thoughts from fans. We will all be so "loud" on the web Monday after the race. Some it will be Sunday. I think that we need to see at least 3 races for us to form opinions before that it will still be conjecture. All the F1 one servers better stand by because sunday after the race they will be working overdrive. They always used to say that true form did not appear until the races got to Europe. Although that is less true than it used to be, I think you're right, John, that we need to see quite a few races before the whole picture begins to emerge. I remember after the Australian GP last year, everyone was saying that the season would be a walkover for Ferrari. Even though Ferrari did win as it turned out, things were not nearly as straightforward as we had thought initially. Can I be permitted to put what might be a rather controversial viewpoint - I don't think Toyota actually care where they are in the World Championship or where their drivers end up at the end of the year. >I think they are in it to be seen to the general public to be competing at the highest level of motorsport. They know that Joe Public has no idea whether they came 1st or 18th on the previous Sunday (although I am sure that Toyota PR would trumpet a 1st from the rooftops) but all Toyota need to do is ensure that the association of >Toyota and 'very high tech motorsport' are clear, implying also a roll over of that technology into Jo Public's average tin box. To give a little bit of meat to this viewpoint, I spent a lot of time over the period of the last F1 season working at or visiting our Brussels office which is almost opposite the Toyota building - presumably their Belgium if not European HQ and is no small building. For most of that time, there were at least 2 banners draped from top to bottom proclaiming something like 'Toyota, leading the way in F1' or something similar - I can't remember the words, merely the sense. Given the fact that last year was not exactly a successful one for them, I can only suggest that this was Toyota PR putting a gloss on it knowing that only those people who actually followed F1 carefully would know that this was at best, a rose tinted view and probably a terminological inexactitude (Always wanted to say that somewhere!). However if you analyse the viewing numbers estimated by Bernie's guys and assume them to be accurate (! ), and then extract the 10% at most who can tell you what happened to Toyota to +/- a couple of places then compare these figures against the numbers who actually see the banners, I believe I have made my case. Additionally, it explains some of the apparently illogical decisions that Toyota have made recently such as not trying to sign Alonso - sign him and the press focus is then on the former champion's team and Joe Public might actually notice what Toyota is actually getting up to. No Alonso, no headlines but continuing presence instead. Keep your heads just below the parapet guys, enough to be seen to be in the game but not to have visible disasters. So the logical conclusion to my theory is that Toyota will remain in F1 indefinitely - or rather, until the marketing people decide that Joe Public has changed his views on the advantages of being associated with F1 - like the other manufacturers actually. Phew, glad to get that off my chest, wonder what comments you have? I must admit that I've heard before that it is sufficient for Toyota to be involved in F1 - it may well be true. The company is very conservative in its philosophies and it has certainly done them no harm in the marketplace. But I do wonder just how much their presence in F1 actually helps their sales - it may be sufficient for them but I can't see too many customers being drawn by it. At the same time, I hope you're right that Toyota will stay in the game whether or not they win. F1 is having a hard time hanging on to the teams it has at the moment and I see no bright prospects for future entries. Toyota do at least help to make up the numbers and supply engines to Williams! I don't believe Toyota don't care about winning. Their attitude to sport has always been to try and win. A company that doesn't care about being seen to win does not build totally illegal engines. And Toyota got kicked out of rallying for that offence. There has to be considerable loss of face trawling around near the back and as we know from the Mike Gascoyne sacking Toyota will not tolerate loss of face. I fully agree with you Simon. The latest issue of f1 Racing has a very enlightening article on brand exposure. You would be quite surprised to find Toyota in 5th place, behind MdLaren, Ferrari, Renault and BMW-Sauber. You don't need to win to have your product seen and recognized. Believe it or not Spyker is 8th! Some of this can be put down to the bold red and white colour scheme, but as long as Toyota is recognized as being involved in motor racing, and in F1 in particular, the bean counters will keep signing the cheques. Which leaves little motivation to retain the likes of Gascoyne, or to find a suitable replacement, if one were available, now that Brawn is a Honda man. How about if Honda start beating Toyota outa sight? Surely then something must stir in the Toyota breast...? Thanks Clive for hearing my thoughts. But if Honda are 12th and Totota 14th.....? I don't think it will make any difference whatever. That's true, Simon - it would take quite a spectacular performance from Honda to really worry Toyota. It may be that we assign too much needle between them anyway. Remembering that Suzuka is Honda's track and Fuji Toyota's, they didn't seem to have too much trouble in agreeing to alternate the Japanese GP between them, whereas Toyota could easily have been awkward and kept it all to themselves. Possibly because the 2007 Japanese Grand Prix was a national embarrassment, which Toyota is still trying to clear up months later. In fact, that race probably did more damage to Toyota than anything the team itself did (and I'm not referring to the team getting a 13th and a DNF, but the traffic chaos and the spectators whose view was blocked by more than rain). Two thoughts, Alianora: firstly, Force India have been surprisingly quick in testing, often reaching the midfield for the day. And, secondly, I have a feeling that Honda will turn out to be quicker than their test times would indicate. They have problems with the car but, judging from the comments of the drivers, they are not as fundamental to the car as were last year's. It would not surprise me if the Hondas manage quite respectable performances, even in the early races. Okay, maybe i was a little to hard on Trulli there, Alianora. But the fact is that i can't remember when i last saw a more boring human. It may be because i don't read that much magazines, or that i tend to select the drivers i prefer to follow more closely, and after that just catch the things that glance before my eyes about the other drivers. I am not even close to having the knowledge and insight in F1 that you have, so i have no intention what so ever to try to put you in place. I was merely just expressing how i see things, and the combination of Toyota F1 and Jarno Trulli is really one of the saddest sights i know about. Giving big promises and cant even hold on to a single one of them. They would surely be good politicians here in Sweden. I think that description would fit politicians the world over, Björn! But we all have our likes and dislikes amongst the drivers and Jarno does not stand out as one to raise strong emotions, either way. I have quite liked him over the years, although it is very frustrating that he rarely races as well as he qualifies. There have been some signs of improvement in that area over the last two seasons however. Bjorn, I didn't think you were trying to "put me in my place" - you are simply putting forward your opinion, and in large part, you have a point. Jarno is pretty self-contained (hence why spotting him smile takes some doing), and I will admit that Toyota could do with someone with more energy and positivity as his team-mate. Hopefully Timo will fill that role as Ralf Schumacher could not. I respect Jarno for his professional approach, though I don't get particularly excited by his racing the way I do about some others. Still, I think that Jarno is better than Toyota. Its corporatism and committee-based approach would squash nearly anyone's originality - this is the team that foisted zero-keel on Mike Gascoyne at the end of 2005 irrespective of whether that would make the car go any quicker (it probably didn't). After three years of stagnation and the team still behaving in a way that encourages stagnation, I'm not surprised there's a bit of a glitch in the obligatory "make-the-team-look-good-before-the-season-starts" script. That's a heavy point there Alianora, and that may be the source of all of my inability to feel any kind of commitment for the team, it's drivers or the company in a whole. All it does reaks of it's own inability to commit it self to get a grip on things and move forward. To put that in Jarnos defence, it may be that there's not really that much to smile about when working for Toyota.